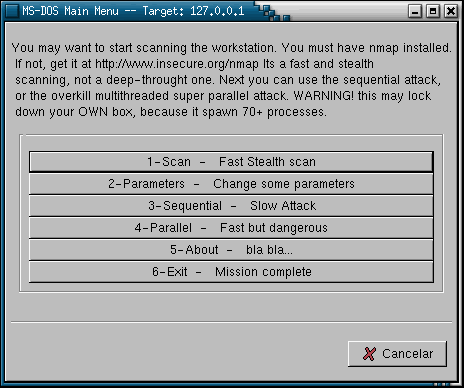 The victim of the attacks are usually win95, win98,win98sr2 and winNT4 boxes, but may work with other systems too. The main objetive is to remotely hang the box. May work with older versiones, but i only test it with this ones. and maybe with redhat 7.1 too. and ejecute ./compile.sh .The generated binaries must then be moved to the ./bin directory. Fig. 1: The console version. Fig. 2: The gnome version.